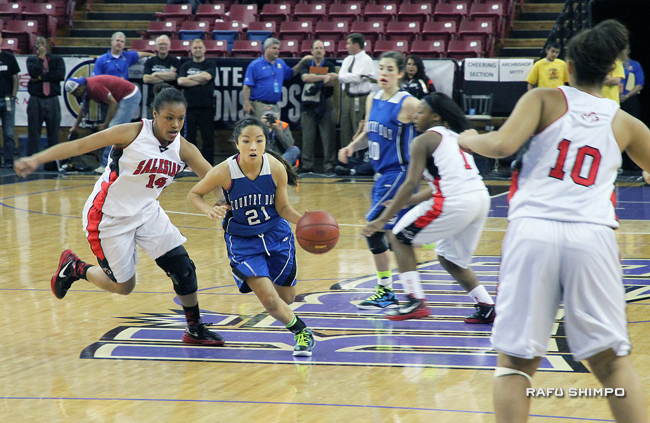 La Jolla Country Day’s Brianne Yasukochi dribbles through the Salesian defense in Friday’s CIF State Div. IV championship (Photos courtesy ALLAN LAMKIN). 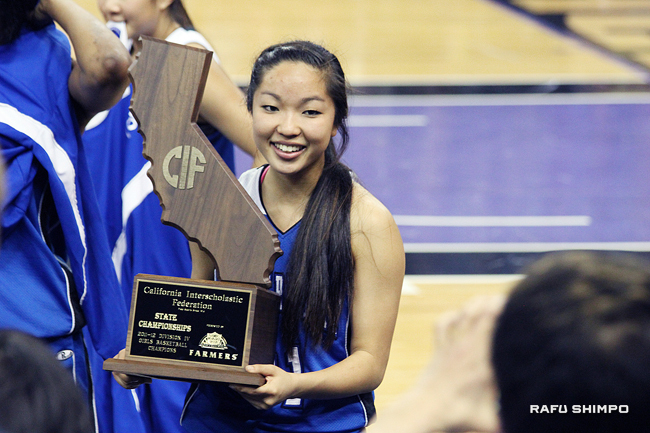 For Brianne Yasukochi, hoisting the CIF State Division IV basketball trophy on Friday was a moment to step out from a couple of shadows. For her and her La Jolla Country Day teammates, it meant redeeming themselves after a crushing loss to powerhouse Windward in last year’s Southern California Regionals. It also served as a moment for the junior to claim the limelight previously held by her older sister, Britinee, a bona fide star at rival Bishop and then later at Occidental College. The Torreys, ranked No. 9 nationally by ESPN, won their third state championship in style, thoroughly dominating Northern California regional champion Salesian, 72-39 at Power Balance Pavilion. Country Day opened the game with nine points–all on 3-pointers–and never looked back, leading by at least 10 for most of the contest. The Torreys (32-1) were led by junior Kelsey Plum’s 32, while Maya Hood scored 19 with 13 rebounds. Yasukochi was 1-for-4 from beyond the arc and finished the day with three points. Mariya Moore led Salesian (31-5) with 19 points, MaAne Mosley had 10 and Sumiko Eryes added one point in the loss. Yasukochi said her team’s upset loss to Windward last year served as a rallying cry all season long. Country Day head coach Terri Bamford echoed the pain of being ousted last year, and said her players found new strength from the experience. La Jolla Country Day will have a new mission next year, to defend their title, and they look to be in great shape for that. Not only did the Torreys manage to stay relatively injury-free for most of this season, they will lose only two seniors to graduation. “We have Brianne and Kelsey coming back, and we have a great group of young kids who will be ready to step up and play,” Bamford explained. Most of the team members will play over the summer on a traveling club team sponsored by Country Day alum and current Minnesota Lynx star Candice Wiggins. Until then, Yasukochi and her teammates are ready to bask in the glory of taking prep basketball’s top prize … but it will have to wait a bit. Yasukochi poses with La Jolla's championship trophy. In the CIF State Div. III girls’ title game Saturday, the result for Laguna Hills was far from palatable. The Lady Hawks managed to sink only 7 of their 39 shots in a humbling 62-24 loss to Bishop O’Dowd of Oakland. It is the lowest point total ever in a CIF state girls championship game. Only three players scored for Laguna Hills, who were simply outclassed by a team that boasted at least four players over six feet. Celia Marfone and Maddy Ziering-Smith accounted for all but two of the Hawks’ points, 12 and 10 respectively. Brooke Shimazaki added two for the final total. Laguna Hills found themselves trailing by 10 points in the first few minutes of the game and never recovered. Hawks head coach Jim Martin told the Rafu last week that he knew competing with this team would be a monumental challenge, and after the game, he said his fears had been confirmed. “I knew from watching tape what we were in for. Between their size and their speed, that’s quite a combination,” he said. It was little consolation for his players, who were crestfallen after their second State appearance, despite a fantastic season that included a CIF Southern Section crown. Laguna Hills won the title in 1997. The dynasty continued to be built for Mater Dei, as both the girls’ and boys’ teams won state titles. The girls captured their third championship in as many years by topping Berkeley, 57-40, in the Div. I final. Kau’ilani Miki-Han scored two points in the win for Mater Dei, who finished the season at 34-3. Not to be outdone, the Monarch boys hit a record-setting six 3-pointers in a 66-48 Div. I victory over Sheldon of Sacramento on Saturday. Jamie Kobayashi did not score in the win, the ninth state title for Mater Dei’s males.